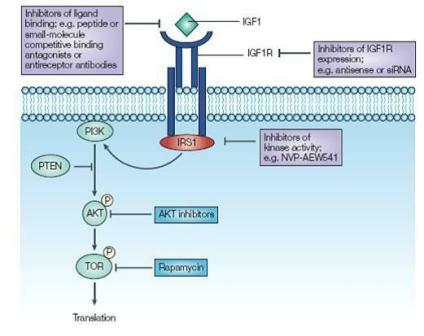 The IGF system is comprised of the IGF ligands (IGF-I and IGF-II), cell-surface receptors that mediate the biological effects of the IGFs, including the IGF-I receptor (IGF-IR), the IGF-II receptor (IGF-IIR), and the insulin receptor (IR), as well as a family of IGF-binding proteins (IGFBPs). IGFBPs affect the half-lives and bioavailability of the IGFs in the circulation, in extracellular fluids, and may exert IGF-independent effects under certain conditions. Insulin-like growth factors I (IGF-I) and II (IGF-II), also known as somatomedin C and somatomedin A, respectively, are members of the insulin family of polypeptide growth factors. Human IGF-I is a single chain 70-amino acid polypeptide cross-linked by 3 disulfide bridges, with a calculated molecular mass of 7.6 kD. The IGF1 protein displays homology to proinsulin. Using a sequence that is identical in human IGF-I and IGF-II as probe, IGF-II was cloned from an adult liver cDNA library. The deduced 180-amino acid prepro-IGF2 protein contains an N-terminal signal sequence followed by the mature peptide and a C-terminal extension called the E domain. Both the signal sequence and E domains are proteolytically removed to generate the mature 67-amino acid peptide. The putative 180-amino acid IGF-II precursor starting at met-24 has a calculated molecular mass of 20.1 kD. The IGF-II structural gene maps locus 11p15.5. The receptor for IGF-I and -II is a member of the tyrosine kinase growth factor receptor family. Two alpha subunits and two beta subunits make up the IGF-I receptor. Both the Î± and Î² subunits are synthesized from a single mRNA precursor. 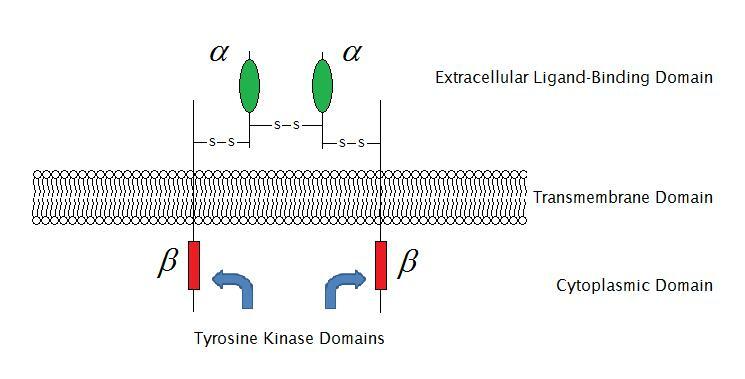 The precursor is then glycosylated, proteolytically cleaved, and crosslinked by cysteine bonds to form a functional transmembrane Î±Î² chain.1 The Î± chains are located extracellularly while the Î² subunit spans the membrane and are responsible for intracellular signal transduction upon ligand stimulation. The mature IGF-IR has a molecular weight of approximately 320 kDa. Activation of this receptor and its intrinsic tyrosine kinase activity initiates a signaling cascade that involves multiple intracellular signaling pathways, such as the phosphatidylinositol3-kinase and MAPK pathways, that are responsible for the diverse target actions of these growth factors, which include increases in cell division, cell size, protein synthesis, cell migration, and inhibition of apoptosis . Many of the signaling elements that are downstream from tyrosine kinase activation have been characterized, but several of the molecular events that occur before or concomitantly with kinase activation and whether these early events can influence the ultimate outcome of IGF-I-stimulated signal transduction have not been determined. of action, but it is now recognized that IGF1 is also synthesized in other organs where autocrine or paracrine mechanisms of action are important. The IGF system plays an important role in normal growth and development as well as in a variety of pathological situations, particularly tumorigenesis . IGF action is also important in the development of specific organs, such as in the nervous system, in which IGF signaling regulates neuronal proliferation, apoptosis, and cell survival. IGF action plays a critical role in the development and progression of human cancer. A growing body of epidemiological data suggests that high levels of circulating IGF-I constitute a risk factor for the development of breast, prostate, colon, and lung cancer. In addition, the expression levels of the IGF-IR and IR are predictive of breast cancer outcome. 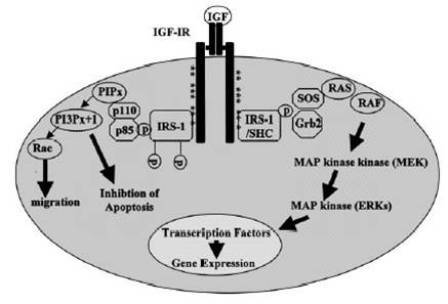 Experimentally, modulation of IGF-IR activity affects the growth of many types of tumor cells. 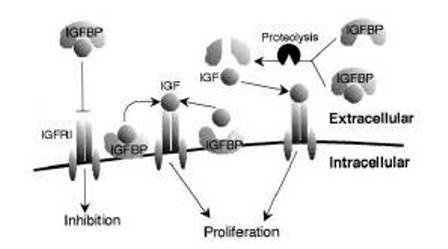 In addition to their roles in IGF transport, the six IGF-binding proteins (IGFBPs) regulate cell activity in various ways. 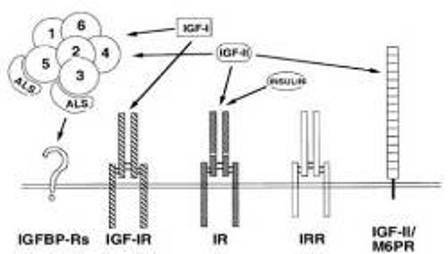 By sequestering IGFs away from the type I IGF receptor, they may inhibit mitogenesis, differentiation, survival, and other IGF-stimulated events. IGFBP proteolysis can reverse this inhibition or generate IGFBP fragments with novel bioactivity. Alternatively, IGFBP interaction with cell or matrix components may concentrate IGFs near their receptor, enhancing IGF activity. IGF receptor-independent IGFBP actions are also increasingly recognized. IGFBP-1 interacts with integrin, influencing cell adhesion and migration. 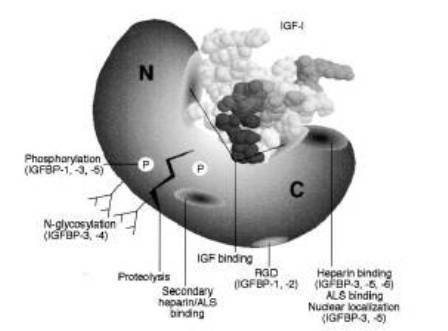 IGFBP-2, -3,-5, and -6 have heparin-binding domains and can bind glycosaminoglycans. through Smad proteins, and influences other signaling pathways. These interactions can modulate cell cycle and apoptosis. 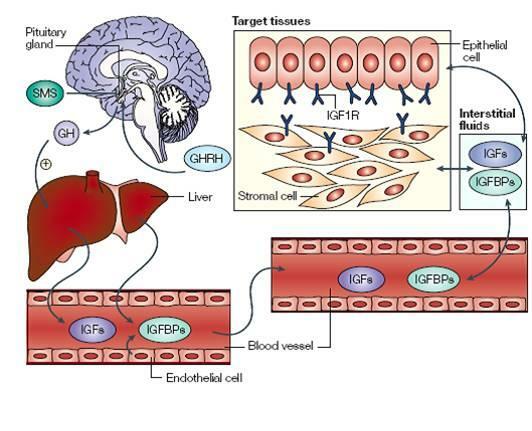 Because IGFBPs regulate cell functions by diverse mechanisms, manipulation of IGFBP-regulated pathways is speculated to offer therapeutic opportunities in cancer and other diseases. Scheda realizzata da Mattia Silvia e Todaro Maria.